Not so bad considering all that was going on this weekend. Can we just agree that Katherine Kellgren is one of the great audio book narrators of ALL time? Listening Time: 3 hours, 15 min. 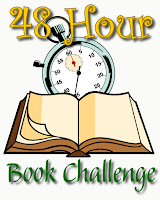 Total Time devoted to #48HBC = 10 hours, 15 min. I haven't gotten into audiobooks much yet, except to keep the little ones quiet in the car. Maybe I need to find something done by Katherine Kellgran! I've enjoyed reading your 48hrc posts. Good work! Great job, I hope to see you participating again next year! I know you had a busy weekend and think that it's awesome that you gave the contest so much time. Thanks for playing! I'm glad that you still participated, even though you had other things going on, Camille. A couple of years ago I was in that situation, and I just gave it up completely, and missed out. I listened to The Left-Handed Lady audiobook, too, and enjoyed it.